Costway 22901-CYWH is a stainless steel water cooler and dispenser with a top loading bottle design and 5-gallon capacity. It gives you the instant cold and hot water options, but not room temperature like on some other models. 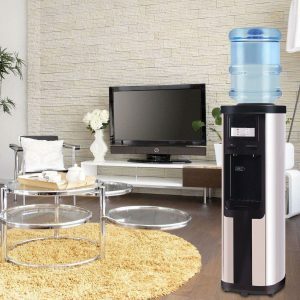 Costway Water Dispenser looks nice and modern in vibrant stainless steel and black and will add to any decor in your home, office or wherever you use it. It weighs 24 pounds, is 10.5 inches wide and 36 inches tall, has a standalone design and with its curves, it looks good from different angles. It is suitable for use with 2 to 5 gallons of water bottles. You will have very quick access to very cold or boiling hot water (500 watts heater) with the mechanical push-in faucets. There is a detachable drip tray so you can clean it easily.It includes a decent water guard system so you will not be spilling or wasting water when you’re placing the 3 or 5-gallon bottles at the top. The LED status indicators just above the hot and cold water faucets help make the operation easier. The switches for turning off how and cold water (connected to the tanks) at the rear will help save on energy bills as well as for preventing burning incidents. And there is also an integrated Child Security Lock to help control your kids’ access to hot water- protecting them against burns. It includes a high quality and powerful yet low-noise compressor with an 80W power (115V and 60Hz) that cools water quickly and efficiently, also with the help of the exact temperature control technology. It has a 3.2-litre capacity cold water tank with a 0.8 liter per hour cooling capacity. You will get instant cold water between the temperatures of 42.8 to 50 degrees Fahrenheit (6 to 10 degrees Celcius). 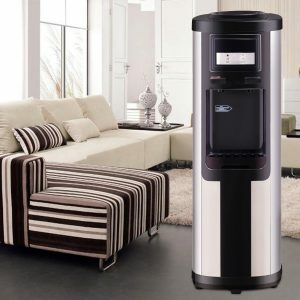 And you have a 1-litre size hot water reservoir with a 3.8 liter per hour heating capacity. Both the hot and cold water tanks are food grade stainless steel that is sanitary, safe and durable and you will get pure, fresh and tasty water at all times. Hot water temperature is specified between 190.4 and 203 degrees Fahrenheit (88 to 95 degrees Celsius). You will find a cabinet for storage at the bottom section of the water cooler. It also includes a disinfection cabinet with an ozone generator that works efficiently in helping kill the harmful bacteria. Please make sure you place the water dispenser on a solid flat ground and not on thick carpet. And try not to bump it as it will be a little heavy with the full water bottle on top and you could tip it over. You could also consider anchoring it to the wall if you have small kids in the house. Overall this is a good value for money product.